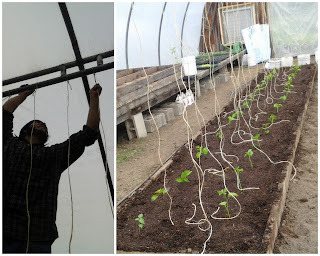 In a fit of productivity, Jared + I planted the greenhouse this afternoon with purple tomatillos (that's right, purple!) It has been tough to get into the fields and plant with all of this RAIN (we got over 6 inches in the past 3 days! ), so it's nice to be able to get stuff planted indoors, at least. We even got started on trellising!